This passport was issued in New York to the vessel Magdalen, which was under the command of James Wilkenson and had a carrying capacity of 355 tons (known as “burden” or “burthen”). There is no information on destination or cargo, but there is the interesting note that the Magdalen carried 10 cannons. This could indicate she was heading for waters such as the Mediterranean where she might encounter pirates. This Mediterranean passport was issued during the last year of Thomas Jefferson’s Presidency. 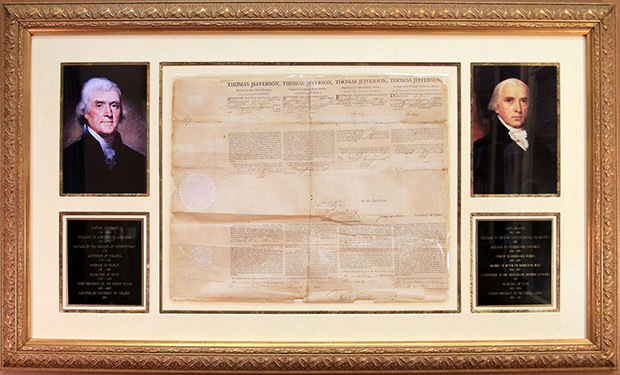 It is signed by President Jefferson who served two terms from March 4, 1801 to March 4, 1809. During that time he sent a naval squadron against the Barbary pirates in North Africa and acquired the Louisiana territory from France. During the Napoleonic Wars both Great Britain and France seized American ships, cargoes and men. To punish them, Jefferson and Congress imposed an Embargo Act, which was signed into law on December 22, 1807. The Embargo was immediately controversial and proved to damage the nascent American economy far more than the French and British. It was also signed by the man who would succeed Jefferson as President, James Madison. Madison was a native Virginian who was educated at the College of New Jersey (Princeton), graduating in 1771. During his distinguished career,he was a member of the Second Continental Congress and sponsored the Bill of Rights while a member of the U.S. House of Representatives. He served as Secretary of State and was instrumental in carrying out Jefferson’s diplomatic agenda from May 2, 1801 until March 3, 1809. The following day he became President. It is also signed by Collector of Customs David Gelston, a distinguished merchant and politician. He was very active in New York politics during and after the Revolution, signing the Articles of Association in 1774 even though it would hurt his business. He worked closely with Aaron Burr and was a delegate to the last session of the Continental Congress. He was appointed Collector of Customs for the Port of New York by Jefferson in 1801 and served for twenty years in that post. Another unique element of this passport is that just beneath the engraved image of a lighthouse and ships near the top, it carries the words “E. Savage FC” (FC meaning “fecit”, Latin for “he made it”). This indicates that the image was created by the distinguished American portrait painter and engraver, Edward Savage. He painted numerous portraits of prominent individuals and his portrait of George Washington and his family is in the National Gallery of Art in Washington. This document is printed on vellum and as is typical of Mediterranean passports the top is scalloped where the top portion was cut off and sent to United States consuls in the Mediterranean for later matching with the passport held by the ship. It bears the Great Seal of the United States on the lower left.